“…that Christ may dwell in your hearts through faith. And I pray that you, being rooted and established in love, may have power, together with all the saints, to grasp how wide and long and high and deep is the love of Christ” (Ephesians 3:17-18 NIV). In this passage from Ephesians Paul calls out the four dimensions of God’s love. 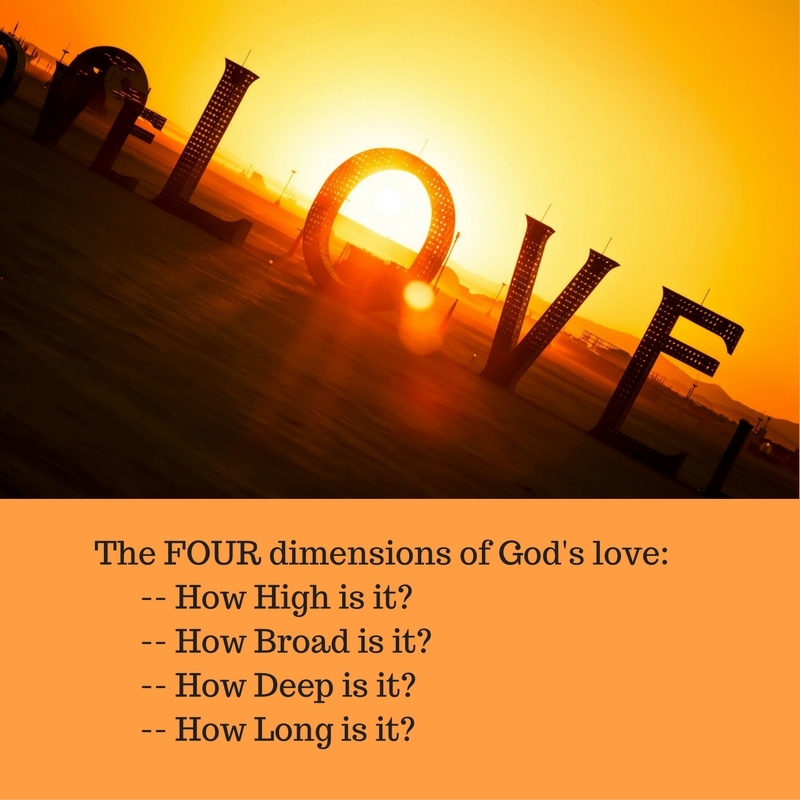 Have you ever thought about the dimensions of God’s love? Have you ever truly grasped the width and length and height and depth of the love of God? In this world, our perception of God is limited. We look at Him through a finite lens, and even when we think we see Him as majestic and incomparable, perhaps we are leaving something on the table…First Corinthians 13:12 confirms: “For now we see only a reflection as in a mirror; then we shall see face to face. Now I know in part; then I shall know fully, even as I am fully known.” Paul claims that there is more to love than we see, and that it has dimensions that go beyond our perception. Paul’s definition of love is steeped in the Hebrew Shema, which reminded believers to love God with every means at our disposal: “Hear, O Israel: The Lord our God, the Lord is one. Love the Lord your God with all your heart and with all your soul and with all your strength.” (Deuteronomy 6:4-5; Jesus quoted that passage in Matthew 22:37 when challenged to give the greatest commandment.). So do you love God with all your heart and soul and mind? Have you grasped the four dimensions of God’s love? In this life we dabble about with romantic love, we cherish motherly love, we love our friends, and of course we love animals and food and possessions and things. And we talk about God’s love… But Paul’s picture of love suggests that God’s love is infinite and powerful and amazing: perhaps we can broaden our perception. Paul says that when we connect with love’s transforming power, we will see the dimensions of God’s love. Read a verse you’re familiar with, John 3:16, and think about the four dimensions of God’s love: “For God so loved the world that He gave his only begotten Son, that whosoever believes in him should not perish, but have everlasting life.” The verse that everybody knows contains the truth and power about God’s love that everybody should grasp. Look in John 3:16 and ask yourself, How high is God’s love? How wide? How deep? How long? They’re in there. Go deeper. That perfect, Godly love will start with Jesus dwelling in my heart. So awesome they can make you weep: it’s wide, and high, and long and deep! And make a list right there beside: how long, how high, how deep, how wide?